Several years ago we implemented a Bradley VDC-Assist Initiative; that creates Revit accessible restroom and locker room layouts for client projects. These projects continue to reveal seven (7) emerging trends (design, technology, standards); that are influencing accessible design for restrooms and locker rooms. These 7 trends, guidelines and digital tools; may affect your future Accessibility Design projects. These are ‘smart-technology’ hand washing systems; that provide water, soap and hand drying; that are centrally located at the hand washing basin. A visitor standing or in a wheelchair, can accomplish the entire handwashing process at the basin with their hands in the basin. Each function (soap, water, dryer) is delivered by infrared accessible, touchless fixtures. For a wheelchair visitor, there is no reaching up for paper towels and the water running down the visitors’ arms or onto their clothes. Visitors with clean, but wet hands don’t need to touch the wheelchair wheels as they move from the counter to the towel dispenser or hand dryer. Convenience, reduced floor space, improved & safe accessibility, low water consumption, eliminates paper towels & waste and cleanliness provide additional value to both visitors and owners. Many of the current handwashing systems are designed with prefabricated access panels beneath the wash basin. Panels enclose, protect and aesthetically cover the plumbing & mechanical connections beneath the countertop. In addition, they guard wheelchair visitors from touching the hot water piping below the basin with their legs. 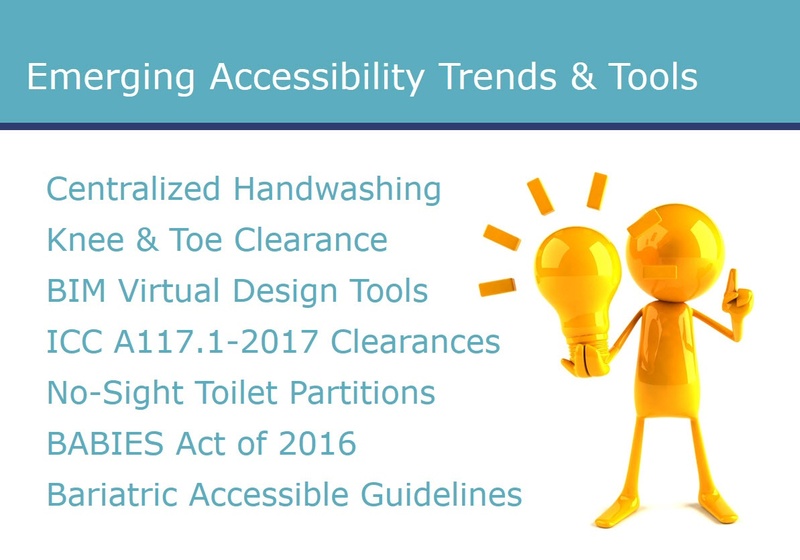 Knee and Toe Accessible Clearances for knee and toes beneath the sink; are defined to ensure a wheelchair visitor can access the faucet. 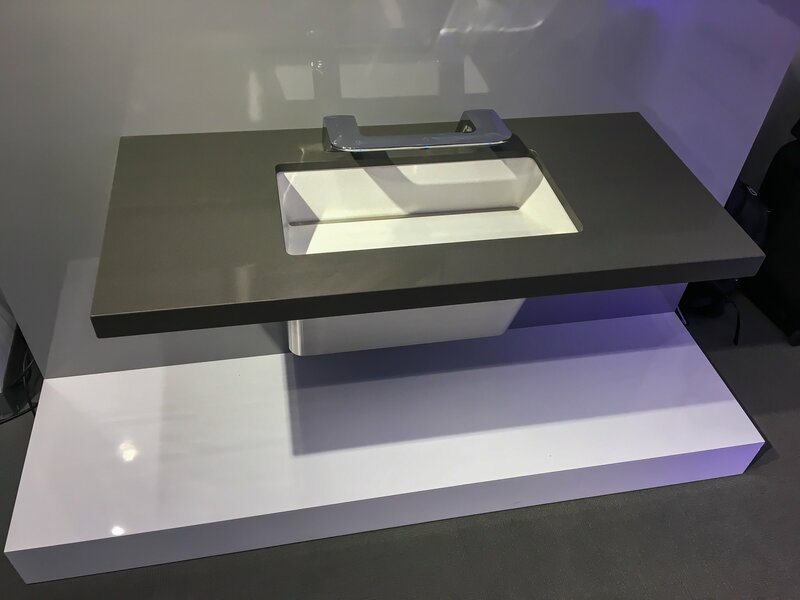 The lavatory system shown above also meets the ICC\ANSI 117.1 11 Enhanced Reach Depth requirement from the front face of counter to the faucet & soap. These clearance dimensions may be defined regionally. Canada & Quebec Building Code Standard Ontario & British Columbia Building Codes Verify accessible codes both locally and regionally. #1) Pre-built Revit Toilet Rooms: BIM & VDC Managers have libraries of prebuilt building products, like Windows, Doors, Walls, Plumbing Fixtures and Toilet Room Accessories. They will create prebuilt BIM room types; like toilet and locker rooms and copy these Room BIM Models into their BIM projects. Accessories like Grab Bars are inserted and placed with defined distances and fixtures are placed at their accessible heights. These prebuilt templates expedite the accessibility design process while serving as a nice learning tool. 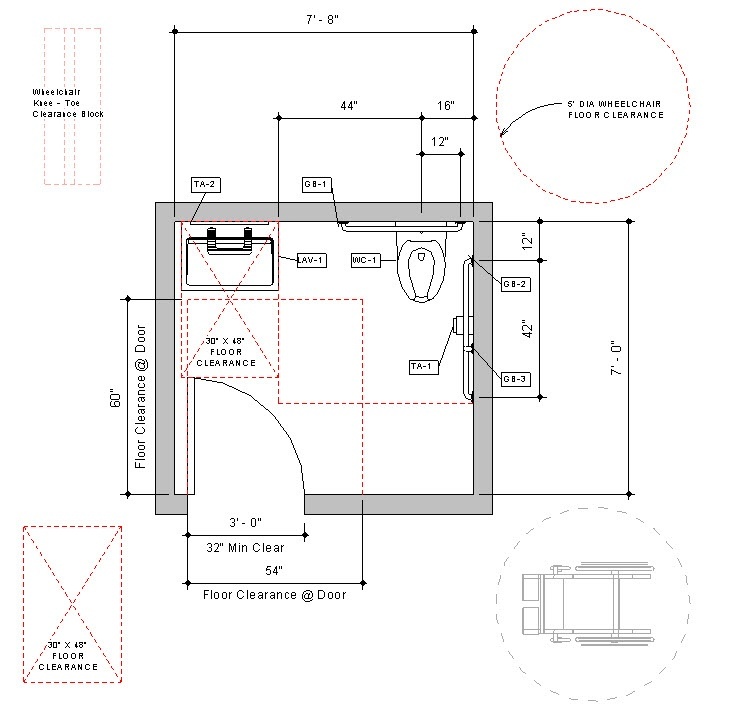 #2) BIM 3D Clearance Boxes like the one in red (above) are placed under sinks and lavatories to 3-dimensionally verify clearances, such as ADA Knee and Toe Clearances beneath the sink. 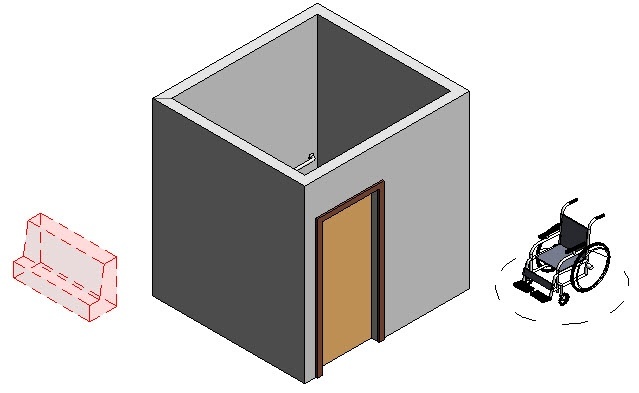 BIM Clearance Boxes can be used anywhere the designer wishes to verify accessible clearances are retained throughout the design process. They are used in BIM model entrance doors, partitions, shower entrance and lockers to visually ensure access & clearances are maintained. If set correctly, BIM software (like Revit) can run interference and clash detection to identify encroachments into accessible clearances. #3) 3D Construction Document Views: Designers can easily set multiple 3D camera views to better display the accessible design intent of a space. As products are positioned in line with each other in an orthographic view (2D plan & elevations), a 3D view may display & define the product installation more easily within an accessible space. Integrating 3D Isometric and Perspective Views into the Construction Document set is becoming more common. The ICC A117.1-2017 Standard for "Accessible and Usable Buildings and Facilities" was adopted with a first printing in May 2017. The document is about 200 pages. Consider focusing your review in the section titled “Building Blocks” for the new wheelchair space clearance updates for accessible restroom and locker room design. Accessible Toilet Partition to Accommodate the new 52” long wheelchair clearance. The adoption of these standards into state, regional & local standards underscores your efforts to verify accessibility codes for your 2018 projects. Facility Owners are selecting variations of No-Sight Toilet Partitions to provide a higher level of privacy around the the toilet partition cubicle in their facilities. Some owners choose a No-Sight option that just blocks visibility into a stall at the 'side edges' of the door. Others select a longer door panel that has a 'bottom edge'; that is closer to the floor. The longer door panel has a 'top edge' high enough to eliminate viewing over the door panel and into the stall. The partition side panels, that separate the stalls will use these new elongated dimensions. 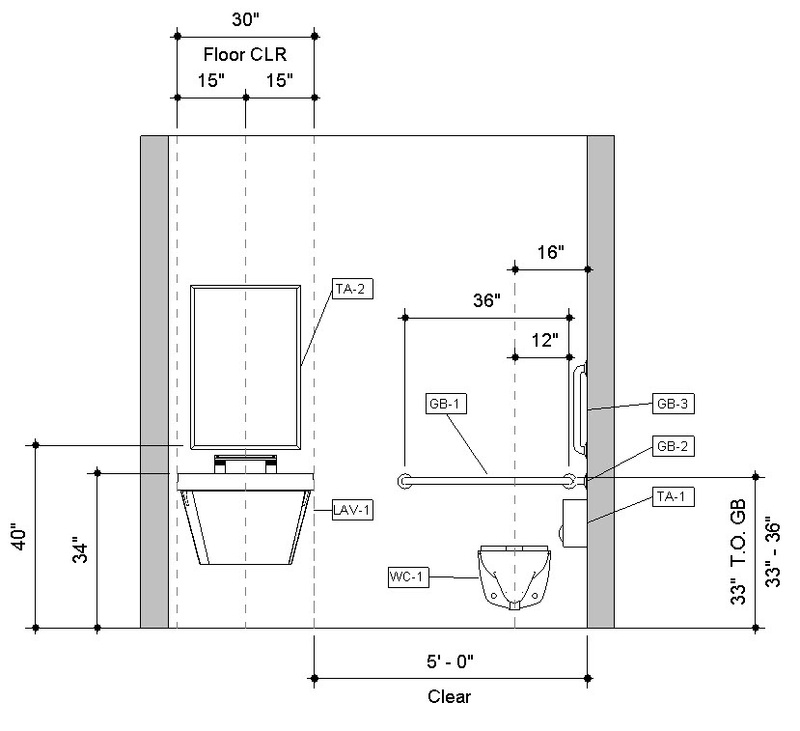 Accessible Design Concern: As the bottom edge of doors and panels are closer to the floor, the ADA stall may need to become wider and/or deeper to accommodate the complete turning of the wheelchair within the stall, as toe clearances are no longer applicable under the panels. The BABIES Act, or Bathrooms Accessible In Every Situation Act, (Pub.L. 114–235) is a United States federal law passed in October 2016. The law requires baby changing tables in all publicly accessible, federal buildings. Baby-changing accommodations must be available in both male and female restrooms, ending the practice of providing changing tables only in women's restrooms. Subject to any reasonable accommodations that may be made for individuals in accordance with the Americans with Disabilities Act (42 U.S.C. 12101 et seq.) restrooms in a public building shall be equipped with baby changing facilities that the Administrator determines are physically safe, sanitary, and appropriate. The term `baby changing facility' means a table or other device suitable for changing the diaper of a child age 3 or under. The Bill has several Exceptions listed; where this requirement for an existing public building may not apply. As designers, consider how previous public building requirements have often become private building standards. The expansion of Healthcare is considered a Mega Trend; which includes Bariatrics. Bariatrics is the branch of medicine that deals with the causes, treatment, and prevention of obesity. Currently, there is not a set accessibility standard or code for Bariatric Design. The Facility Guidelines Institute (also known as FGI) was the first organization to offer guidance in their 2010 edition of “Guidelines for Design and Construction for Healthcare Facilities”. FGI was founded in 1947 and is a nonprofit organization. As of July 2017, FGI is the most adopted source for Bariatric Guidelines. In 2018, FGI replaced the term “bariatric patients” with “patients/people of size”. A bariatric layout has increased clearance space, structural support and larger component requirements. ADA Accessibility Design Standards have made community life more accessible for all of us. With automatic doors, sidewalk ramps, stair rails, wider hallways, accessible toilet rooms and attention to the design and construction of buildings, everyone has benefited. Temporarily disabled folks like someone with a broken leg and even people carrying packages or dragging luggage find it easier to move through built facilities. Accessibility-based adaptations have proven especially useful to parents managing young children. Any parent with children in tow, will tell you how much easier (and safer) it is to take your children into an accessible toilet room stall with them. Accessibility Design is benefiting everyone. As firms build their Revit \ BIM project library with pre-built Building Product Manufacturer (BPM) models, the next step in efficiency is to pre-build common room types with those models. This provides a learning process for less experienced design staff to learn accessible, ADA and ANSI accessible design rules and guidelines. Pre-built Revit rooms with installed common Revit furniture, fixture and equipment models; expedite the construction modeling and documentation process. Here is an example of a single occupancy accessible toilet room; that utilizes the Bradley Verge with WashBar Technology 3-in-1 touchless handwashing lavatory; which is ADA compliant. 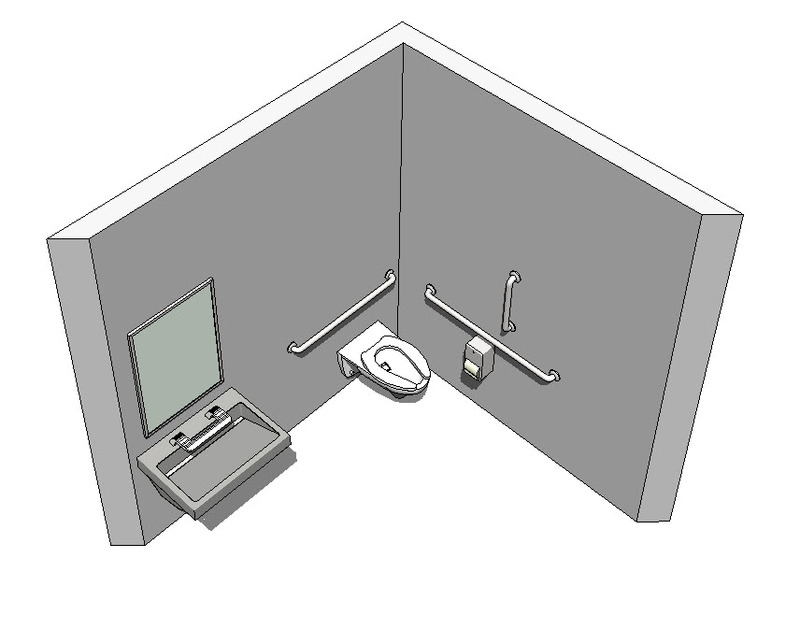 Download the single occupancy accessible toilet room Revit model.